It's the end of August!?! Since my last post, I've been buried in a mountain of work, which is sort of nice and sort of not. Of course, there was also a lot of travel arranging, which is like a second full-time job, at least the way I do it. There's also been plenty of recreation, including hosting houseguests, seeing bands, dancing, going to parties, having a girls weekend at a Napa vineyard with the "girls" from college. I also attended a tightly plotted drag show wherein the villain was named PIxie Pardonne Moi (sic). A friend had been tapped to pole dance (badly) during the intermission. Heh. Good times, y'all. I've missed a lot of fun LJ activity. There were memes that seemed exciting, excellent art and fic — some of which I missed, I'm afraid — and this exciting party celebrating the 5th Anniversary of sb_fag_ends! I only got my act together enough to post a silly prompt, alas, but the mods over there deserve to be fêted! Take a bow bogwitch, quinara, and shapinglight! Garlands also to all the contributors who continue to make that comm so great! Go, read, comment! I know I will. My recent pre-series Giles fic, Giles and the Mountain, was nominated by very kind person(s) in Round 32 of the Sunnydale Memorial Fanfic Awards in the Best Gen, Best Drama, and Best Characterization (for Giles) categories, and also in Round 12 of the No Rest for the Wicked Awards, in the That Old Gang Of Mine (best gen) category. I'm touched that my sporadic work still appeals to somebody out there! There's still time to nominate your favorite fanworks, and make a fellow fan's day! A few of you have been singing the praises of the Thug Kitchen cookbook, so I decided to check it out. It's changed things up around here, and McDiva and MiAmor have been pretty game. My favorite so far is the Coconut/Lime/Mango Brown Rice with Red Beans. which is on the regular rotation already. It's making vegan look better, I've got to admit. More Thai and Japanese recipes? Yes, please. I've also been pickling green beans and making fruit crisps like...my grandmother? Life is pretty delicious, these days. Isn't it pretty? It may raise the dead, for all I know. And no, I do not need an intervention. My kitchen is colorful, but not dangerous. This entry was originally posted at http://rebcake.dreamwidth.org/39712.html. Please comment here or there using OpenID. And congratulations on the nominations and raising the dead. Thanks, sweetie! I'm feeling accomplished! 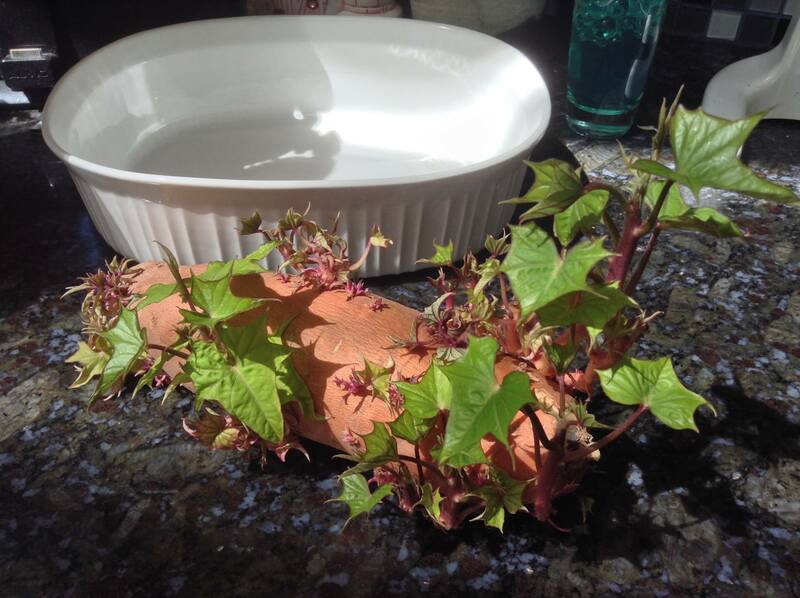 Also, is that plant actually growing out of your worktop, or is it growing out of something that's on your worktop? Thanks for the nice things you said about sb_fag_ends. It's really nice to be appreciated. bogwitch and quinara are brilliant at thinking up fun ways to do prompts. The sweet potato/yam is blessedly not attached to the counter, but is an island unto itself. I found it at the bottom of what I laughing call my root cellar, under a bunch of other potatoes. I think I'm going to plant it. It's shown extreme determination to thrive. Actually, I think I like all of them (except maybe pears. Don't like pears). We also have a thing called fruit cobbler, which is sometimes confused with a crisp, but has a doughier, more biscuit-like topping. That's the USA version of biscuit. Also good, of course. I think cobbler has crept this side of the Pond too. Apparently, it differs from a crumble because the topping has a more 'scone-like' consistency. Over here, that would mean that the only difference is that the crumble part is mixed with milk instead of water, as you make shortcrust pastry dough (crumble) with water, and scone dough with milk. Does that sound at all the same? Yes! Scones are the sweeter British equivalent to biscuits. I keep forgetting about them, which is sad, because they are delicious! They are very nice when freshly made (preferably still warm). Not so great after a day or so. Something I ask myself every day.